Attention-deficit hyperactivity disorder (ADHD – previously referred to as ADD) is a complex neurobiological condition affecting how people think and act. Because ADHD affects how the nervous system develops, it is referred to as a neurological developmental disorder. Children, teenagers and adults with ADHD often have problems paying attention and maintaining focus on tasks and activities that are important to their success and enjoyment in life. This may include trouble sitting still or being quiet, controlling impulsive behavior, or becoming hyperactive and restless. All of these behaviors have the potential to interrupt one’s ability to focus and accomplish tasks at hand. Imagine a shiny light or a buzzing sound that is constantly present and distracting you from completing you’re work. Your attention is always being diverted away from the tasks at hand to a stimulus that has nothing to do with accomplishing your goals. The distraction can also be a thought that gets stuck in your head and cycles over and over again, taking up your attention as it takes your mind off purpose. This is what ADHD can be like and why people with ADHD have trouble paying attention and maintaining focus at home, at school and at work. ADHD is not only a childhood disorder but may continue well into adulthood. Many adults with ADHD continue to struggle with significant attention and concentration problems that interfere with everyday life even though the symptoms of hyperactivity have subsided with age. Misconceptions about adult ADHD unfortunately may prevent many people from seeking the treatment they need. At Nelson Chiropractic and Functional Neurology short screenings are often preformed to make a confident diagnosis. However, they are not considered to be adequate documentation by disability/accommodation resource officials in academic settings. When addition documentation is required referral is made to local psychologists with expertise in the measurement of specific brain processes associated with ADHD. When the brain is functioning efficiently it should communicate between both hemispheres as well as within each hemisphere at lightning speed. This communications occurs because nerve cells connect with one another, pass on information, and the reset, repeating this process millions of times a minute. With an inefficient brain, the timing and processing of information is often out of sync, passing on only partial information or leaving out information all together. The result is Functional Disconnection Syndrome, with miscommunication being at the root of all types of neurobehavioral and learning problems. Science has now revealed that the brain is plastic (changeable) and adaptable where previously it was thought to be static, unable to grow, change or adapt. We now know that the brain is able to create new neural pathways in response to stimulus in the environment. Difficulties associated with both learning disorders and neurobehavioral disorders result, not because of genetic factors in most cases, but from environmental influences that affect genetic expression (epigenetics) and are therefore often correctable. These difficulties therefore can be often corrected and those suffering from Functional Disconnection Syndrome can benefit from appropriate and timely therapies. With a thorough understanding of the full scope of the individual’s diagnoses appropriate treatment options can be established essential for planning and executing a successful treatment program. By determining strengths and weaknesses of brain processing, the root causes are identified at the very beginning, avoiding the trial and error approach to treatment. 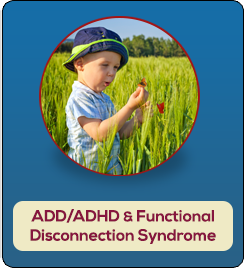 With the right diagnosis, treatment plan, and support, symptoms of ADHD and the associated Functional Disconnection Syndrome can be effectively managed and significantly improved. Treatment often involves some combination of behavioral therapy, sensory integration and multimodal stimuli. This multi-faceted approach helps achieve optimum body and brain function. Although medication is not a part of our program we work with parents and physicians to accommodate the need for medication. Dr. Lawrence Nelson is the Director of Nelson Chiropractic and Functional Neurology in Tigard, Oregon. Board Certified in Chiropractic Neurology, he brings his extensive training and clinical experience to assist his patients in relieving pain and suffering. Dr. Nelson is an expert in Whiplash and Concussion recovery, ADD/ADHD and Disconnection Syndrome, and promoting Brain Health and Longevity.